Today is the last day of 2017, which of course has gone by in a whirlwind. This year was filled with a lot of firsts and new achievements for us personally and as a company. I’m excited to see what 2018 will have in store for me, hopefully some good challenges. Oliebollen is a Dutch New Years tradition that we keep (as with many of the other eating traditions). They are basically when a donut meets a fritter and is then filled with apple or raisins, or both and then of course veiled in icing sugar. Doesn’t sound too bad eh? This recipe makes about 10 balls, you can double it or half it to fit the right number. Also, I don’t have any raisins in mine as I’m not partial to dried fruit but if you were to add them in mix them in at the same time as the apple. Start by heating 200ml milk in a small pan until it’s just starting to simmer, take off the heat and place to the side. In the bowl of a mixer add in the flour, yeast and lemon zest, give it a stir and then add in the warmed milk and egg. Mix with the dough hook on a low speed until everything comes together in a dough consistency. Add in the remaining milk, melted butter and salt and mix for approx 15mins on a medium to low speed. Fold in the apple pieces until it is evenly dispersed, careful not to overmix. Cover with a damp cloth for about 30-45 mins in a nice warm area (kitchen is usually ideal) The mixture should double in size when ready. Fold the mixture through with a spoon or spatula and let rest again for another few mins. Heat your oil to about 180° (if you are using a deep fat fryer you can ususally set it to a temp, otherwise use a kitchen thermometer) When the oil has reached the right temp, dip an icecream scoop into the oil very quickly just to coat the metal, and fill a scoop of the batter, drop directly into the hot oil. Repeat process a couple of times but try not to overfill the oil as this will drop the temperature and they wont cook as quickly or come out nice and crispy. I generally cook 4 at a time, but this will depend on the size of your pot/fryer. Cook for approx 3 mins on each side, they should be lovely and golden before sieving out and placing on some kitchen paper. Let cool for a few minutes and cover in icing sugar. 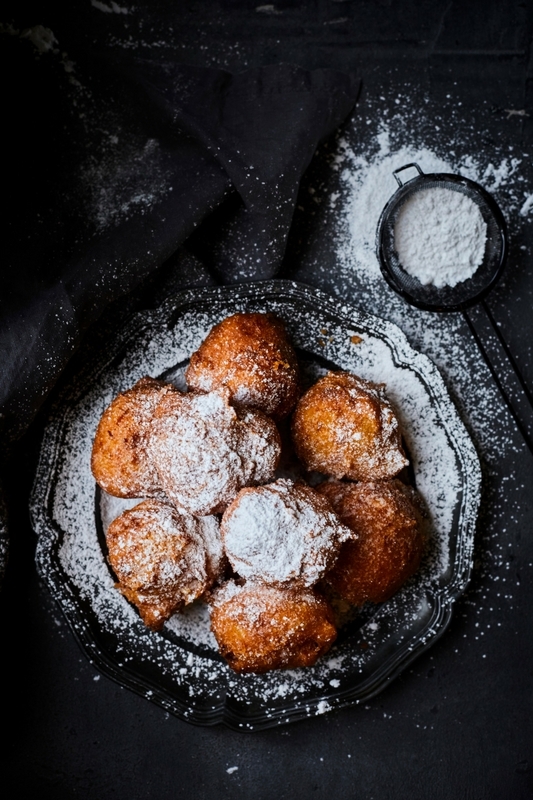 Oliebollen can be eaten warm or cold, but are best eaten on the day of cooking.